Everything...from the comfort of the room to the incredible view! Supermarket very close to the condo...food trucks just a short walk where we had a choice between Fusion food, Mexican food, or BBQ and more! We enjoyed eating in since the kitchen was stocked with essential supplies. Also it's a short drive to great snorkeling beaches. Amazing property. Each room is right on the ocean. Our room was recently updated; we were overwhelmed how nice the room was and how well stocked it was. Property management was kind, prompt and helpful. We started our stay on Maui at a large resort. Nice - but can’t match our experience at Maui Kia Condos. We will be back! The location was right on the water and it was fantastic for whale watching, which was our main purpose of the trip. Also, the supermarket was very close. Location was amazing! Waves were crashing on the rocks right below the balcony. Saw whales from bed! Amazing place for sunset. Our room had binoculars, sunscreen, boogie board, wine glasses, and lots of other useful stuff! Everything was fantastic. The ocean view from the suite is unbelievable - you don't want to leave the room. 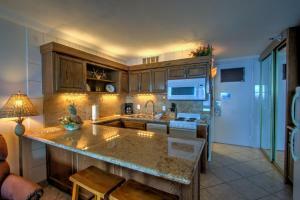 The kitchen is fully equipped, there is plenty of space and the lanai is just gorgeous. Very comfortable bed, not too soft, not too hard. Everything is within walking distance, the swimming beach, supermarket, shops and restaurants. Superb staff and service. The location was very nice. The grounds and the unit were clean. Location (right on the water, could see whales from the room), overall value was good as well. It is great deal for the money. Grocery store Times is cross the street. great location. No beach in front of this condo, but so easy to access to the beach from each side condos. I stay at Junior size. It is big enough for 2 people if you are used to Queen size bed. The location is excellent. It is so close to the ocean. We enjoyed the whales' activities every morning. Bed was hard and room service only replaced towels. Would have been nice for them to sweep the floors at least. 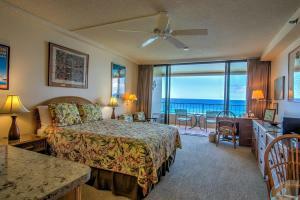 Lock in a great price for Maui Kai Condos – rated 8.8 by recent guests! One of our top picks in Lahaina.These oceanfront Lahaina apartments offer panoramic ocean views of Kaanapali Beach, Lanai, and Molokai. 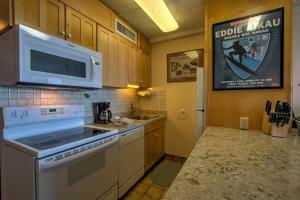 Each apartment includes a fully-equipped kitchen and free WiFi. A patio or terrace with oceanfront views is featured in each suite at the Maui Kai Condos. A flat-screen cable TV with DVD player is also offered. First morning in room coffee is provided to guests. An outdoor swimming pool and hot tub are located on-site. BBQ facilities, table tennis and a library are available for guest use. Snorkeling opportunities are located nearby. Maui Kai Condominium Resort is 6 miles from historic Front Street in Lahaina. The Kahului Airport is 27 miles away. Haleakala National Park is 50 miles away. 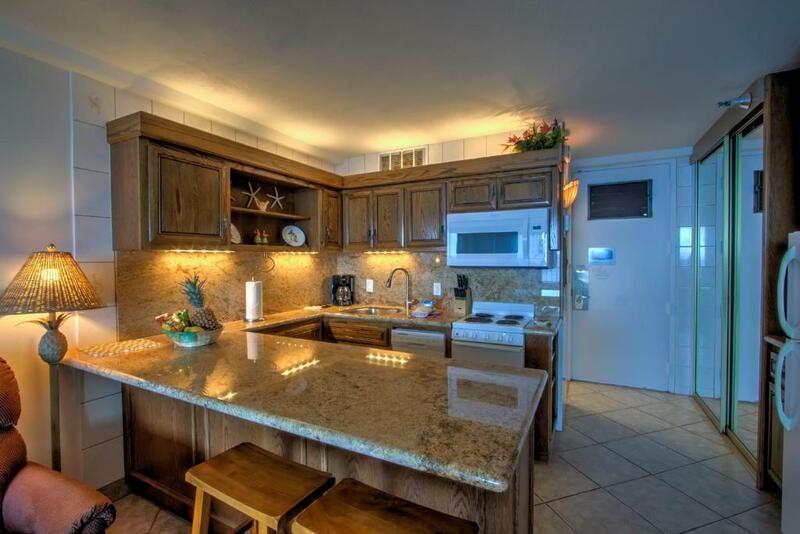 When would you like to stay at Maui Kai Condos? 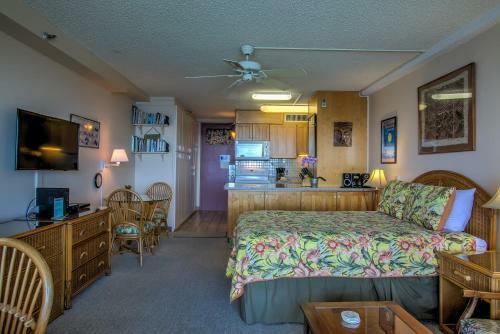 This studio-style suite features a sitting area, full kitchen and full views of the Auau Channel between Molokai and Lanai. 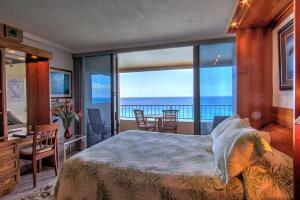 Featuring ocean views, this air-conditioned suite offers a separate seating area and fully-equipped kitchen. 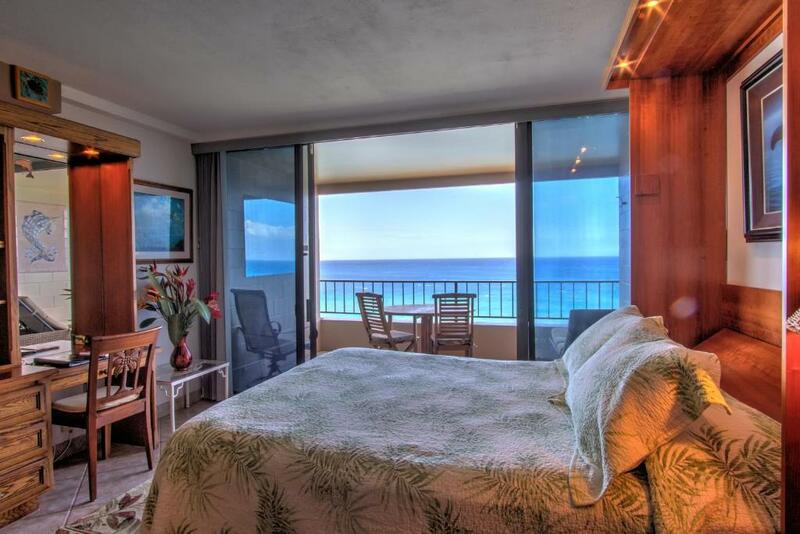 This suite features views of the Kaanapali Beach coastline, Pacific Ocean, Lanai, and Molokai. A separate sitting area and full kitchen are included. Maui Kai is all directly oceanfront. We are 20 feet from the beautiful Pacific Ocean. All of our units have the most fabulous unobstructed ocean views. In the winter months you can whale watch right off your lanai. The rest of the year you will see all kinds of sea life and can walk the beach to black rock or take the nearby beach walk. We have some of the most beautiful sunrises and sunsets. Come enjoy our warm friendly little piece of paradise. Construction work will be done on the property From April 1 - September 30, 2017. The north Kaanapali area filled with wonderful restaurants, Times supermarket, shopping, fish market and farmers markets all within walking distance of the property. You can surf, snorkle, kayak,and enjoy all types of water activities right off of our property. We are within 7 miles from the lovely town of Lahaina where you will find art galleries, shops, restaurants and our local harbor. House Rules Maui Kai Condos takes special requests – add in the next step! Maui Kai Condos accepts these cards and reserves the right to temporarily hold an amount prior to arrival. Stays of 4 or more nights will have daily housekeeping and checkout service provided. Stays of 2 or 3 nights will have checkout service provided. Please note, room photos are for representative purposes only. Exact furnishings and setup may vary. Please inform Maui Kai Condos of your expected arrival time in advance. You can use the Special Requests box when booking, or contact the property directly using the contact details in your confirmation. The beach is a little rough right on the property.. But it's not a far walk to find a better spot. Only a few minutes walk from tasty food trucks at night. Honestly, no issues to report on. Pool is in the parking lot and not good. If you don’t care about the pool it won’t matter. Expensive for a week stay. One of the resorts would offer the pool and beach if you don’t need a full kitchen. If you want your own apartment not a hotel room this place was quite good and wonderful views. Beautiful view directly on the ocean. Unit was also great. With the way they call the room, 'Junior Suite,' I took it as a suite room where a bed area is sort of separate. It was a plain studio. My fault for not reading carefully but I wish it was clearer. Ocean right in front of the window. We rented the junior suite. The photos showed the ones that were recently renovated. Ours wasn’t, the shower, bathroom and kitchen were dated and not in great shape. Towel hanger kept coming off the wall. The fridge and stove were not in good shape. Whole place was dated. Would stay in the building again but not in this unit. Cleaning staff were excellent as was the location. Closet door didn't function smoothly (just needs a little TLC). The A/C was a little noisy but it otherwise functioned great. Loved the view and the room location was pretty quiet. Also close to groceries and eateries. Staples within the kitchen were poor at best. More containers (tupperware type items and plastic wine glasses should be provided. We should not have to go and purchase them.) Also the unit is aged and updates to the carpet and kitchen areas are needed badly. Our friends stayed in a private owners room and their room was in much better condition and was taken care of better. Not what we expected. I don't like to be a complainer. It was much smaller than expected and felt stuffy. View was beautiful. The management on premise was no help what so ever. If you need or have a problem after 6pm, you're out of luck. The pool is small, no direct access to the beach.